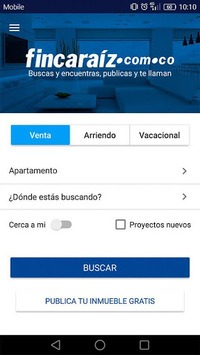 ¿Searching for real estate for sale or rent? ¿Do you want to publish your real estate advert for free? 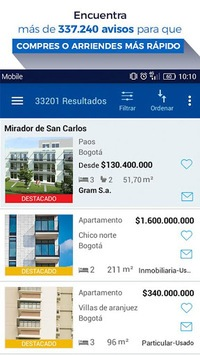 Then install our app from Fincaraiz.com.co and discover a quick and easy way to search, publish, sell, rent and buy apartments, houses, shops, offices and properties in Colombia. Download the app of FincaRaiz and discover all the features we have to offer. - Used and/or new properties. - Type of property: housing and commercial properties, new housing projects, apartments, studio apartments, cottages, house, country house, lots, farms, rooms, parking, offices, shops, warehouses, buildings and more. - Offer type: properties for sale, rent or holiday rental. 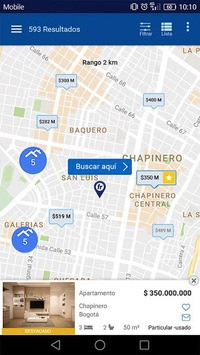 - Location: Departments, zones, cities and neighborhoods. In Cundinamarca, Valle del Cauca, Antioquia, Santander, Bogotá, Cali, Medellín, Barranquilla, Bolívar, Bucaramanga and the rest of Colombia. - Price, area, number of rooms and bathrooms. ✔ Check for relevant information about the properties that you want: Price, photos, location in the map, rooms, bathrooms, owner description, etc. ✔ Use our famous option “near to me” so you can find properties and offers of real estate near your real time location. ✔ Compare the main characteristics of the desired estates and choose the one that suits you. ✔ Save a list of the estates that interest you wit “my favorites” option so you can view then when you need them and can compare them. ✔ Schedule alerts to receive new offers of similar properties to your current search periodically, or find out if a property of your interest lowers its price at some point. ✔ Contact the seller or landlord through WhatsApp, phone call or email. ✔ As a direct owner of real estate properties you can post up to two free ads for sale or lease through “My Properties” function. ✔ Get contacts since the first days of publication by WhatsApp, phone calls or email. Your opinions and recommendations are important to us. Do you like our app? Rate us to keep improving. Follow us in our social networks for more information about real estate news, offers and important real estate events in Colombia.